The Tamolitch Falls was a waterfall on the McKenzie River in Linn County, Oregon. Height of the fall is 49 feet and width is 35 feet. 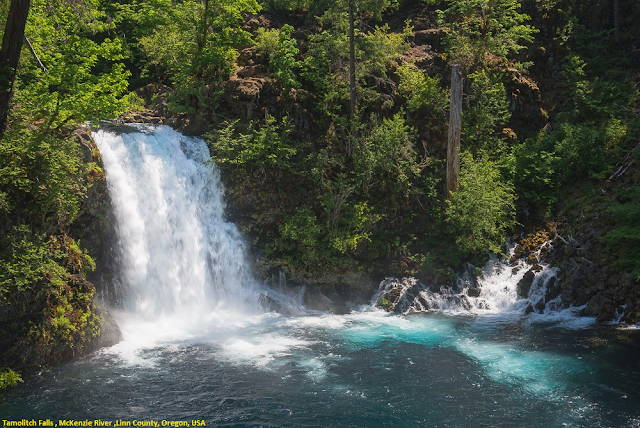 It was located in the Willamette National Forest. In the 1960s, water was diverted for hydroelectric use from the stream above the falls; that section of the stream, as well as the falls, ceased to flow except during periods of heavy runoff or when water was diverted from the dams upstream. When this is not the case, the stream goes underground and now emerges below the falls. At the base of the former falls is the Tamolitch Pool, a small lake that is now at least partially dry most of the time. The area is accessible via Oregon Route 126. From the junction of Highways 20 and 126 (approximately 70 miles east of I-5 in Albany via Highway 20, or 85 miles east of I-5 in Salem via Highway 22), follow Highway 126 south for about 10 miles and turn right (east) onto NFR-730, signed for Trailbridge Campground and Smith Boat Launch. Follow Road 730, bearing right after crossing the river, for another half mile to the parking area for the Blue Pool segment of the McKenzie River Trail and park. Hike the McKenzie River Trail upstream for a moderately easy (though somewhat rocky) 2 miles to the viewpoints overlooking Tamolitch Pool.